A diverse assemblage of corals and sponges, including yellow sponges (lower left) and colonial and solitary scleractinian (stony) corals (center of photo), observed on the western side of Munson Canyon (1,037-1,266 meters). 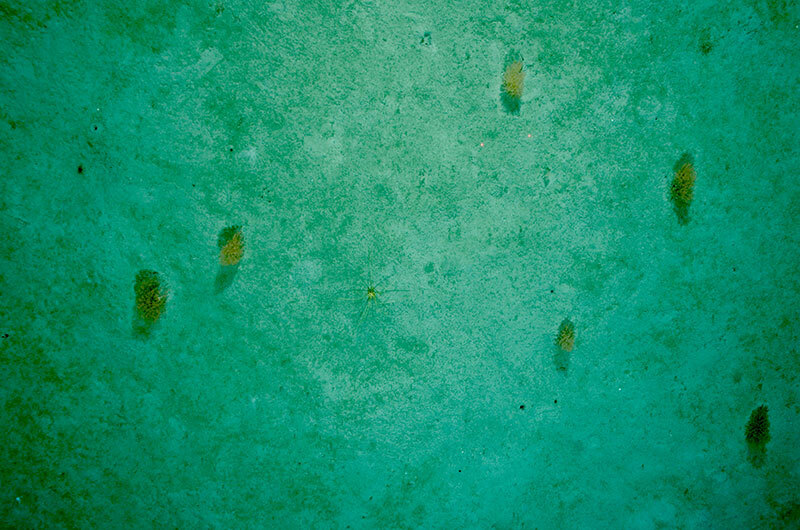 Image courtesy of Nizinski et al., NOAA/NMFS/NEFSC, WHOI, 2013. Download larger version (jpg, 5.2 MB). NOAA is the primary federal agency mandated to conserve and manage the nation’s marine resources, including ecosystems containing deep-sea corals and sponges. As our understanding of the special nature of deep-sea resources has grown, so has the need to prioritize research activities and management to ensure that sufficient action is taken to conserve these resources for future generations. 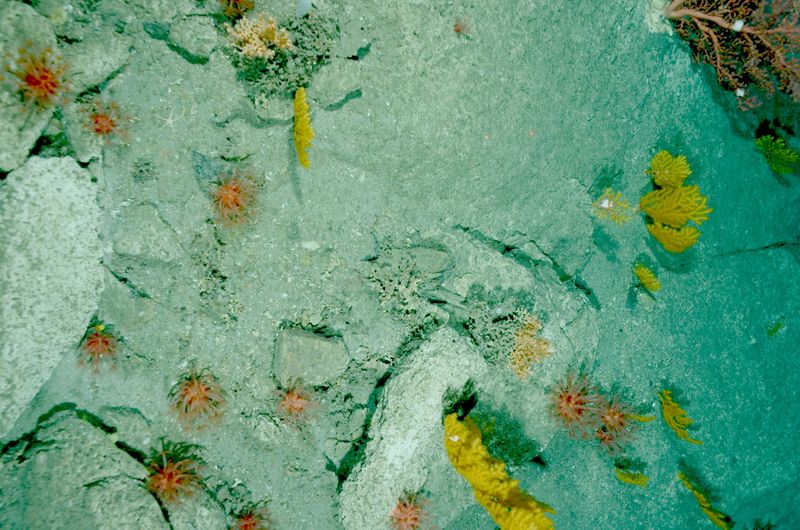 Under the Magnuson-Stevens Reauthorization Act, NOAA is charged with implementing the Deep Sea Coral Research and Technology Program (DSCRTP). Over the next three years (2013-2015), DSCRTP will support fieldwork efforts in the northeast with the Northeast Fisheries Science Center leading this initiative. Back in 2011, information priorities were identified during a workshop where government, academic, and non-government agency scientists came together to discuss research needs in the region. Based on the input provided at this workshop, the Northeast Regional Planning Team formulated a research plan to address these priorities. Fieldwork in the region began last year and we are now gathering information necessary to inform the Regional Fishery Management Councils. Providing information to the councils is the primary function of the DSCRTP, therefore our research priorities are also those of the regional management councils. Two councils operate within the northeast region. Both the New England and Mid-Atlantic Fishery Management Councils are proactively working to conserve deep-sea corals. View of the western canyon wall in Ryan Canyon (1,682-1,832 meters). This canyon was surveyed earlier this summer during an expedition aboard the FSV Henry Bigelow. Image courtesy of Nizinski et al., NOAA/NMFS/NEFSC, WHOI, 2013. Download larger version (jpg, 7.3 MB). Although bottom-tending fishing gear is one of the biggest threats to deep-sea coral habitat, fishing gear is not the only threat. Oil, gas, and mineral exploration; marine debris; and changing environmental conditions can also disturb deep-sea coral habitat. With such a variety of potential threats, it is much better to have conservation measures in place before damage to these fragile ecosystems occurs than to try to restore these habitats once they have been seriously impacted or devastated. This is particularly true for deep-sea corals where much of the life history is unknown and because these organisms tend to grow slowly. For slow-growing organisms, recovery from environmental impacts may require many years. Two deep-sea coral management frameworks are under consideration for implementation by the councils. The first is the broad zone approach. Under this scenario, larger areas along the continental shelf/slope boundary, perhaps along a depth contour, would be designated as areas where impacts from fishing are minimized in order to protect coral habitat. The second type of management strategy is the discrete zone approach. Here, smaller areas where corals are known to occur, or areas likely to contain suitable coral habitats, would be designated protection areas in an attempt to minimize possible interactions between corals and fishing gear. Under both management frameworks, designated areas would be closed to mobile and bottom-tending fishing gears. To make the best management decisions to protect corals and other hardbottom invertebrates, however, the councils need high-quality, contemporary data on deep-sea coral and sponge diversity, distributions, and abundances. Until recently, we were limited in the kinds and quality of data that we could provide to the councils. Literature reviews, historical presence data, and contents of national databases were the highest-quality data available. However, each of these data sources has limitations, and therefore use of these data was done with caution. Fortunately, with results from on-going research, we are making great progress in improving the quality and quantity of data available to the councils. Through partnerships with the NOAA Office of Ocean Exploration and Research (OER), all canyons in the mid-Atlantic and Northeast region have been mapped using high-resolution multibeam sonar. These bathymetric maps provide valuable clues to where hardbottom habitats occur, areas where we are more likely to find deep-sea coral habitats. 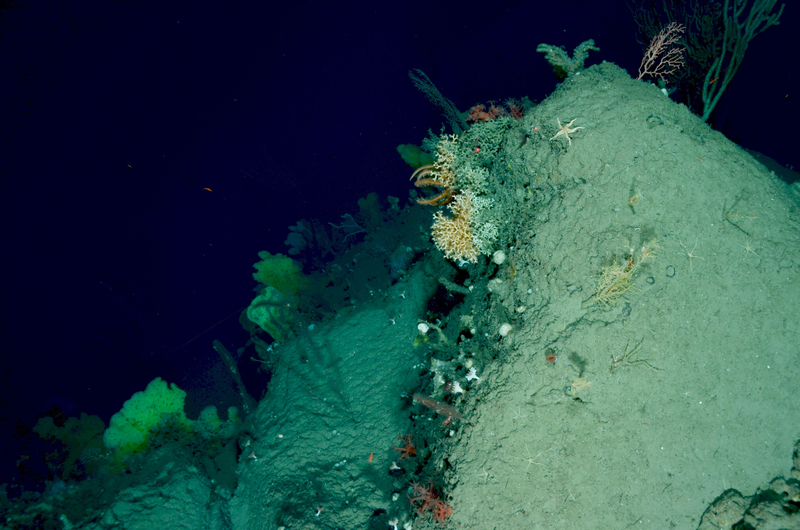 Canyons are one of the most likely places in the northeast region where deep-sea corals are likely to occur. Additionally, NEFSC in partnership with the National Ocean Service National Centers for Coastal Ocean Sciences has developed a regional habitat suitability model that uses available physical and environmental data from where corals are reported to occur to predict other areas where deep-sea corals are likely to occur. A diverse assemblage of deep-sea corals, including Anthomastus sp. (numerous, small red corals in foreground), Paragorgia sp. (large red coral in upper right corner), and Paramuricea sp. (yellow), observed on the eastern wall of Powell Canyon (950-1,180 meters). Image courtesy of Nizinski et al., NOAA/NMFS/NEFSC, WHOI, 2013. Download larger version (jpg, 7.5 MB). Certainly, it is always best to verify these types of data rather than just rely on predicted distributions. In 2012 and 2013, DSCRTP conducted research cruises to ground-truth the multibeam data and model results that predicted several deepwater canyons off the northeastern coast of the U.S. were coral hotspots of abundance and diversity. Using a towed-camera system, we were able to validate qualitatively the predictions of the model. We observed corals in several canyons where little fieldwork had been conducted previously, areas where we knew very little about deep-sea coral and sponge occurrences, not to mention their abundances and distributions. We are now able to provide the councils with much needed quality information to support management decisions in the region. Additionally, we are using these results to generate an improved version of our model. Using geo-referenced coral presence/absence observations in combination with recently collected high-resolution multibeam data, the new version of the model is expected to predict coral occurrence at a finer scale. Thus, our partnership with OER on this expedition to the canyons allows us to gather much-needed additional contemporary data in this region. Remotely operated vehicle operations in underexplored and little-known canyons will add important information to our growing database of known coral locations and provide us with a better understanding of coral and sponge diversity, abundances, and distributions in the region. We will use this information to better inform the councils and assist them in their decision-making process as they work to satisfy all stakeholders in the region as well as to protect deep-sea corals and their habitats.